As technology and communication are continuing to advance at such a rapid pace, the automotive industry is striving to make automobiles safer and more user-friendly than ever before. Part of the industry's safety efforts involve communications between vehicles (V2V) to relay information about road and traffic conditions in the area for collision avoidance, as well communications between vehicles and infrastructure (V2I) to also enhance safety. For example, a vehicle is approaching a signal light, which is red, but it is not slowing down, the vehicle could alert the driver or even brake for the driver to avoid running the red light while also warning cross traffic approaching the intersection that the driver that may run the red light. The technology that makes this possible is called Dedicated Short Range Communications (DSRC). DSRC involves wireless communication meaning bandwidth is limited. Messages need to be short and exchanged quickly.. This is where ASN.1 comes in. The messages transmitted over DSRC are specified using ASN.1 and are made small and and transmitted quickly using the ASN.1 Octet Encoding Rules (OER). The use of OER allows many vehicles to relay short messages to each other about road and traffic conditions in the area and in their direction of travel. These messages might contain information from other vehicles, from traffic signal lights, or from roadside warning signs, etc. This level of communication means that drivers on a freeway could be warned that while they are currently moving at 55 miles/per hour, all traffic 1 or 2 miles ahead is moving at less than 15 miles/hour, and they should be prepared to slow down rapidly. 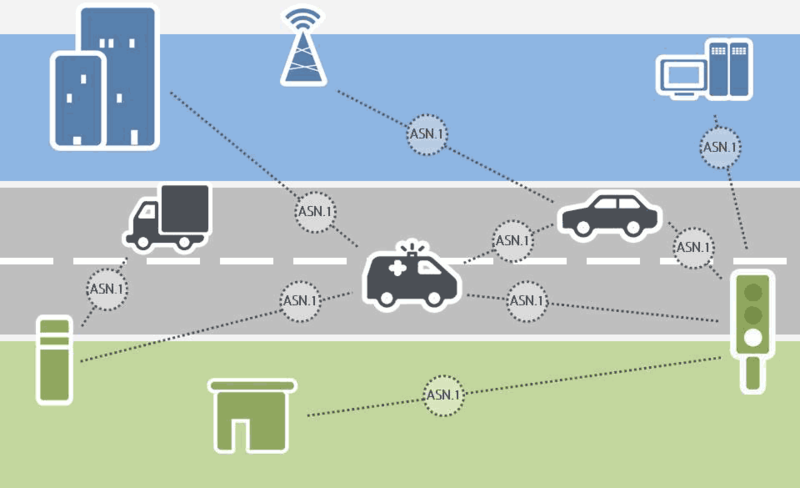 Another area in which ASN.1 is widely being used is telematics, which involves combining telecommunication with information. Some of the valuable uses of telematics are GPS Navigation systems, vehicle tracking systems (which is used for many things from fleets of commercial vehicles and/or trailers or containers to private vehicles with anti-theft systems), and even providing internet access in vehicles (IEEE WAVE - Wireless Access for the Vehicular Environment). ASN.1 is also used in automatic toll collection so that you do not need to stop while driving through toll booths. OSS supports and actively participates in intelligent transportation research, specifically, the new V2V and V2I initiatives. OSS is currently involved in several ongoing automotive research programs. OSS has staff who are members of the SAE Dedicated Short Range Communication (DSRC) Technical Committee. OSS Nokalva has been instrumental in shaping and developing ASN.1 standards, technologies that use ASN.1, and communication standards or projects where ASN.1 has been adopted as the specification language for messaging. OSS provides high performance, highly reliable and high quality toolkits. OSS has extensive porting experience, having ported to over 500 platforms, including several complex embedded platforms. Last but not least, OSS offers exceptional support services.